Because of its speed, accuracy, and its patented Automatic Emissivity Compensation System (AECS). As in all infrared temperature control systems, IRt/c installations should be calibrated to the characteristics of the materials and the process being controlled, in order to insure that the control temperature is accurate. Accordingly, the calibration reference must be selected such that its accuracy is independent of the variables that influence the temperature control accuracy. In the case of infrared temperature control, the major variables are emissivity and ambient reflections. The Microscanner D/DX Series has the necessary accuracy and independence from emissivity and reflection errors, due to its AECS feature. The reflective cup configuration of the sensing head automatically corrects for emissivity by creating a tiny blackbody at its point of measurement. By “trapping” the emitted radiation, and excluding the ambient radiation (thereby replacing the reflected ambient radiation with reflected emitted radiation) the sensing eye sees a blackbody; and thus can report the temperature precisely. The result of AECS is illustrated below. 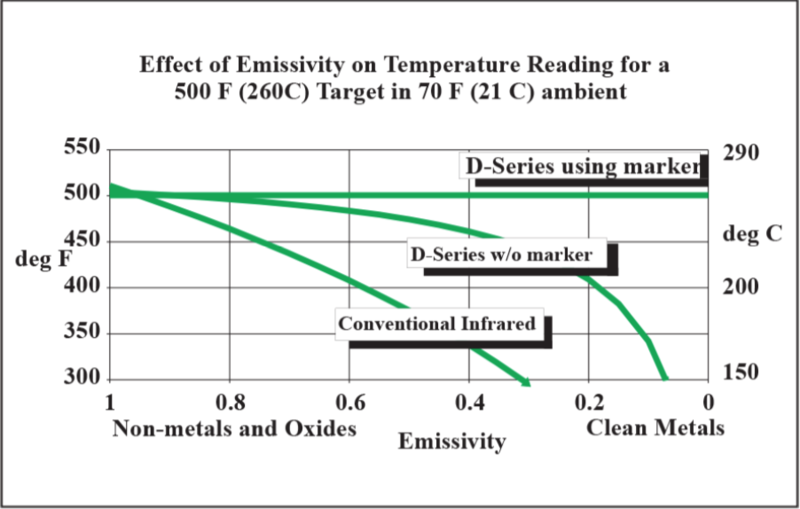 Conventional infrared devices are strongly influenced by both emissivity and ambient variation, while the D/DX Series remains accurate. Additional factors in calibration accuracy are speed and contact error when using conventional thermocouples. The D/DX Series overcomes both problems, and makes it possible to complete the temperature control set-up very quickly and accurately. For further information on Exergen’s Microscanner D/DX Series Infrared Scanner/Thermometers call or fax Exergen or your local Authorized IRt/c Distributor.